[Worcester, Mass. 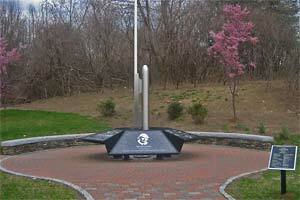 May 3, 2006] On Friday, May 12, 2006 at 2:00 PM, the Goddard Memorial Association (GMA) will officially dedicate their monument at the memorial site on the corner of Goddard Memorial Drive and Apricot Street in Worcester to their namesake, who is internationally hailed as "The Father of Modern Rocketry." It was eighty years ago, on March 16, 1926 that Worcester native Dr. Robert Hutchings Goddard successfully launched the world's first liquid-fuel rocket from a farm in Auburn. "The monument is a beautiful piece of work," notes GMA's President, Barbara Berka. "It features a stylized stainless steel rocket and tower surrounded by eight porcelainized enamel-on-steel panels upon which are recorded highlights of Goddard's life and accomplishments." The text on the panels was researched and written by Berka. The photos and diagrams came from Clark University, WPI and NASA. One of the panels is dedicated to Goddard's wife, Esther, the scientist's assistant, photographer and champion long after his death in 1945. The monument, the skeleton of which is made out of aluminum, is a functional but elegant design by local artist, Joseph Miglionico, and is considered by Berka, a former science teacher, as an "outdoor educational exhibit." Goddard was born in Worcester, educated at South High School, WPI and Clark U. He held 214 patents, many of which were incorporated into the rocket that allowed NASA to put a man on the moon in 1969. Any rocket that is launched today utilizes many of Goddard's pioneering patented inventions. Goddard is buried in Worcester's Hope Cemetery. The Goddard Memorial Association's mission is to bring honor and recognition to Dr. Robert H. Goddard and to name Worcester,"The Birthplace of the Space Age," as he was born, educated and did his most important pioneering work here. The public is invited to the dedication.